Arabdemocracy: 'Avatar': An Anti-Imperialist Epic? Avatar starts on a depressing note. In 2154, humans are still invading foreign lands, digging for underground resources and serving their interests with complete disregard to universal values and life in its various shapes (in this case , the shape of oversized cat-like figures with an unhealthy blue tinge). Not one lesson learned from the Iraq inquiry or the Goldstone report. Not one dent to the might of the military-industrial complex! Things do improve as we realise that a small eccentric group of idealist geeks refuse to abide by the rules and go out of their way to fraternise with the indigenous population. They, well-meaning as ever, end up causing the most damage, although only in the medium term (This is Hollywood after all and a happy ending beckons). I thought here to draw parallels with the kind-hearted American missionaries caught ‘rescuing’ a few dozen Haitian children from their fate as...Haitian children. These, just like Corporal Jake Sully, find themselves misunderstood and vilified from San Domingo to Salt Lake City. A Far-fetched analogy, you might think. Not as ludicrous as the parallels drawn by some with the Iraq invasion. Everything in Hollywood these days seems to refer to Iraq, as if this one tragedy was out of character for Uncle Sam and deserved ad nauseaum analysis. But why look hard when the birth story of the United States is also that of the uprooting of a native people with animist beliefs and a dress sense suspiciously similar to the ‘Na’vis’. 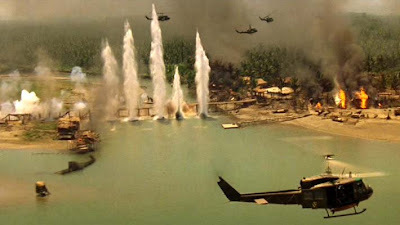 While the jungle on Pandora coupled with the heavy reliance on airborne combat tactics and carpet bombing is reminiscent of the Vietnamese conflict. Nothing new there. As the story unfolds, we are quickly back to old clichés of the all-American hero who gets the girl, dodges bullets and defeats evil. The heartbroken local chief has no choice but to swear allegiance to the well-bred natural leader of men and humanoids alike. Perversely, I can’t think of another occasion where an American audience will be asked to revel in watching Americans troops die in droves while justice prevails. If you are still convinced of an Iraqi reference, then James Cameron must be suspected of links with Al-Qaeda. Unlikely, judging from his lifestyle. I have to conclude that Avatar is pleasant enough to watch and the technology behind it is to be admired. Unfortunately, I am none the wiser about Mr Cameron’s views on imperialism but certainly aware of his taste in music...and on that front not much progress since ‘Titanic’. Condemn Irak war with a fresh new angle may be tricky, and it would be silly to expect that from the Terminator and Titanic director. The only legitimate Avatar's pride should be its amazing technical performance. But for those who expect a new stimulating analysis of American conflicts, you'd better read the book "Blackwater" from Jeremy Scahill, awarded by the George Pol journalism prize: a remarkable investigation on the private army used by the US government. Terrific. I didnt expect it personally to provide me with a new angle or comment on current affairs. These were comments I had read/seen in mainstream reviews of the movie. Thanks for the tip. Will make it my next bedside companion. Saw this film and the only analogy I see is an American one and the only thing modern were the weapons. The Na vi are very much like the American Indian, but you should not be confused that either are animist because they pray when taking the life of what they hunt. Both have a Great Spirit, life giver. It is just respect to the Creator for what he has made, nothing more. Likewise the adoption of the Avatar is also Indian custom. The Navajo had a Jewish Chief Don Solomono. They do such things by choice. There are many Americans that carry Indian blood, aside from the registered tribal members. So I feel you misjudge Americans that they would not cheer the Na Vi. Basically because Indian belief has been all men are brothers. War over race or religion is non-exstant amongst them. This has greatly influenced American thinking before it became a nation, that borrowed some the Iroquois government organization models. Middle East perceptions of other have no relevance to the people of North America. Mainly, because the Indian not only welcomed the foreigner to their land and were willing to share it, but even in many cases showed the foreigners how to survive. I wasnt the one to come up with the anti-imperialist analogy. It was widely discussed in European media. One analogy doesnt cancle another one anyway and we can only speculate at the intentions of the director/writer. I am not sure of your personal experience of Middle Eastern hospitality but it is generally praised. On the other hand, when the foreigner in question shows up on the back of a Hummer, our sense of hospitality is dented. Europeans rarely understand Americans. :) They seem to be taught strange things about our complex history, especially the American Indians. Not much has changed with Euros from the first ones that showed up on these shores. So I can see them giving this a broader application. I too worry about the same thing for the Na'vis' are almost identical to the Indian in outlook and Spiritual traditions. If the maker had a broader application it is not evident to me. To me it is an American story and the Indian has won in real life. What should be taken from this movie in a broader context is that it was a few evil men that forced the greed and conflict. This has also been true in US history. There were always those that rejected how the Indian was treated. Not personally, but I have a female army friend that has done four tours in Iraq. Her main function is water treatment and travels all over Iraq. She has come under fire and fought for life, but has made more friends than anything. No matter where the helicopter flies her at any given time within and hour or two a bodyguard show up outside the post gate. When she returns to the US her voicemail box is full of messages from Iraqi friends.